Kristin Luck was one of the original pioneers of the multimedia online research business – back in 1998 – when she joined ACNielsen to assist in the development of proprietary capabilities for testing full-screen video and other multimedia materials securely online. As a co-founder of OTX (Online Testing Exchange), Kristin Luck built and managed the operational and client management infrastructure that made OTX the fastest-growing research company in the US in 2002 and 2003. After OTX was acquired for a multi-million dollar deal, she started her next company in 2005, Forefront Consulting Group, a research technology consulting firm, which was acquired by Decipher in 2007. Since then she has been Decipher’s resident brand ambassador, spearheading the firm’s strategic client development and marketing outreach. Kristin Luck is a regular speaker at global industry events, and a winner of many prestigious awards, such as the American Marketing Association’s 4 Under 40 Award (2010) and Gold Stevie Award (2012). Particularly, Kristin Luck “felt incredibly humbled and honoured” to receive the MRA’s (Marketing Research Association) Impact Award in 2013, which was granted specifically for the work she has done with WIRe (Women in Research). Founded in 2007, WIRe has grown into a global organisation with events in cities around the world, educational webinar series, and a mentoring programme. “What started as 25 women getting together for cocktails now boasts over 1,000 members globally”, she says. Recently, we took the chance to discuss with Kristin Luck about females in the research industry, and how she, as one of the most admirable entrepreneurs in the global research industry, creates lasting impact on the lives and careers of research professionals. Asia Research: Can you tell us a bit more about the challenges of being a female entrepreneur? Kristin Luck: I believe that women burn with the same ambition that men do to change the world and build successful businesses and, more than ever before, I see my female colleagues striking out on their own. Unfortunately, it’s much harder to obtain funding or investment capital as a female entrepreneur. A recent study found that roughly half of early-stage start-ups have a female co-founder, but those companies are 50% less likely to get follow-on funding than those with all-male founding teams. This is in spite of the fact that female-led companies are 15% more likely to be profitable, and 78% more likely to be selected by their peers for investment. Women typically undersell themselves and their businesses, and this is a problem, particularly in fundraising. Asia Research: Where do you see challenges for females involved in the (global) research industry, and why? Kristin Luck: I don’t think there are enough aspirational roles for women in research, and not enough emphasis on keeping women engaged in their careers, particularly among women with children. WIRe conducted an industry-wide survey in 2012 that showed women are leaving the industry for a variety of reasons – most predominantly due to life factors (work–life balance, childbirth, etc.) – which is why, in large part, women are underrepresented in senior management. I think it’s very challenging for women with children to find success within rigid corporate structures that are, for all intents and purposes, designed for men. Our entire corporate system is based on men working and women staying at home caring for the children. Women’s roles have changed dramatically over the last 50 years, but the corporate system hasn’t. Our challenge is: How do we redesign our business to accommodate women and create a happier, more balanced, work life for both genders? Asia Research: Where do you see regional differences? Kristin Luck: I wish I could say I see some clear regional differences. Unfortunately, although there are some small differences by country or region, it’s negligible. Women in research are underrepresented in senior management, and underpaid (as compared to their male colleagues) globally. Asia Research: Why explicitly, “Women in Research”? Are men allowed at your networking events, and what role do men play? Kristin Luck: We frequently get asked about the inclusion of men in WIRe. I believe that men play a vital role in the progression of women in the workplace, and as such, men are welcome at all WIRe events (one of our Los Angeles events boasted double-digit male attendees in a group of more than 60 women). Our biggest corporate sponsors are organisations led by men. A big part of creating awareness about gender inequality in the industry is to educate both men and women that it exists. Both males and females in management need to collectively support and encourage more women to progress to senior positions. 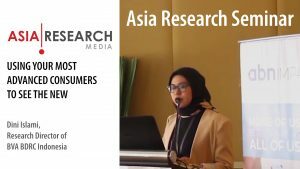 Asia Research: “Encouraging the establishment of empowering and nurturing relationships among women in market research through informal gatherings and educational opportunities” is stated as mission on the WIRe website. Why is mentoring important? Kristin Luck: Marie Wilson, founder and president Emeritus of The White House Project, said, “You can’t be what you can’t see”, and I think that message really resonated with me. It’s challenging for women to visualise themselves in senior management roles if they don’t have an opportunity to see women in those positions. I asked myself, “How are you influencing women around you to aspire as a leader?”, and I feel that mentoring, facilitating that direct connection between women, creates the greatest opportunity for young women to mirror a successful career path. Senior-level women have advice and knowledge that can be vital to helping women new to the industry succeed, so we’ve created some easy ways for them to share, both through our mentoring programme and via our live events and online educational programmes. Asia Research: Why does training play an important role? Can you name some recent training/webinars offered by WIRe? Kristin Luck: Leading by example is paramount, so I try to give our members exposure to successful female executives within the research industry. Recent educational programmes offered by WIRe have included speakers on topics such as compensation negotiation, career advice for breaking the proverbial “glass ceiling”, juggling motherhood and work, tips for conference proposals and public speaking, and many more. 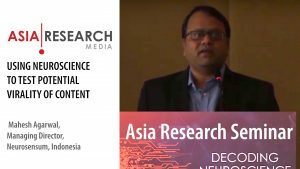 Asia Research: How do you want to develop WIRe further? Or better, where do you see WIRe in 2015? Kristin Luck: I’m really focused on continuing to expand our global footprint. In 2013, we hosted our first event in Sydney, and we’re working towards hosting our first events in Asia and Africa in 2014. We’re also refining our mentoring programme and expanding opportunities for connecting women in markets where we don’t offer mentoring via our online “Office Hours” series, which we’re hoping to roll out in February. My hope is that WIRe will continue to inspire women in our industry to take their own micro-actions to create a more gender-equal working environment – in whatever way they can. Asia Research: Based on your experience of attending/organising global networking events. How do men network, how do women network, and where do you see differences? Kristin Luck: Men and women do network differently. I read an interesting article in which Gail Blanke, a life coach and author, said that men tend to do what she calls “a straight shot”. A man thinks, “Who do I know who has what I need right now?” – could be a job, a contract, a connection – and then he asks for it. Very direct. Asia Research: Can you share some tips on how to network at conferences/global MR events, no matter if you are women or men? Kristin Luck: As researchers we tend to struggle with getting out of our comfort zone. Data, numbers, and statistics are reliable – people, less so. I go to a lot of networking events where I see people only talking to people they know … because it’s comfortable. When I’m networking, I try to meet as many new people as I can, and that’s incredibly challenging for me, because in many ways I’m naturally introverted. My advice is to make an effort to meet someone new at every event. Sit by someone you don’t know at lunch. Smile. Say hello. Some of the best business connections I’ve made have been simply because I made the effort to strike up a conversation with a total stranger. 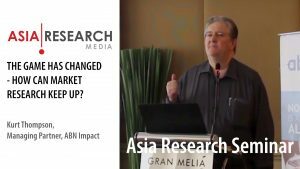 Asia Research: Thank you very much for this interview. First published in Asia Research Magazine Q1, 2014. Interested to receive regular updates from Asia Research? Subscribe here.